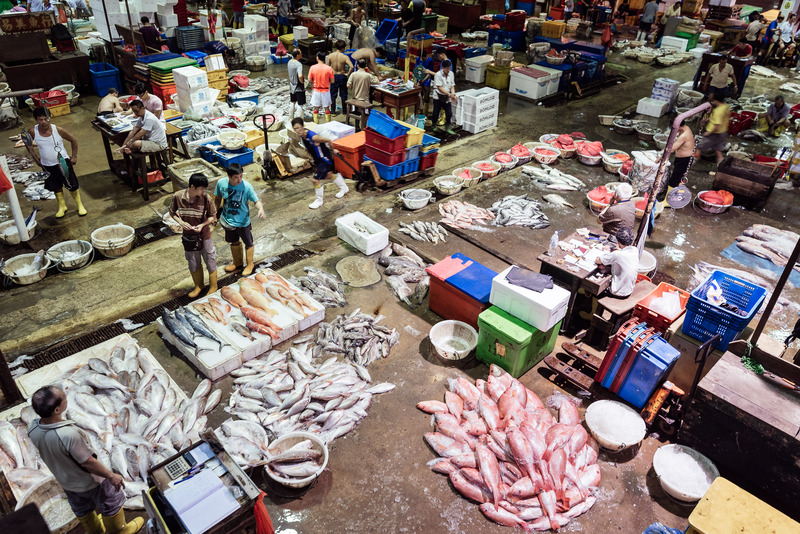 When I think of fish or seafood, I grimace because they don’t have the most welcoming smell – and it reminds me of the wet market near my childhood home in Pek Kio. I can remember vividly the colourful smells of the market, the red lampshades over warm-coloured florescent light bulbs reflecting light off the slimy scales of fishes, and the chaotic chatter and shouts of housewives haggling with butchers and fishmongers. Even though I didn’t particularly like the trips to the wet market with my grandmother, I do keep that memory in mind fondly because it’s getting rarer to find such places in Singapore. One such place that still exists in fast-moving Singapore lies in the most-western part of the island, facing the Straits of Johor. 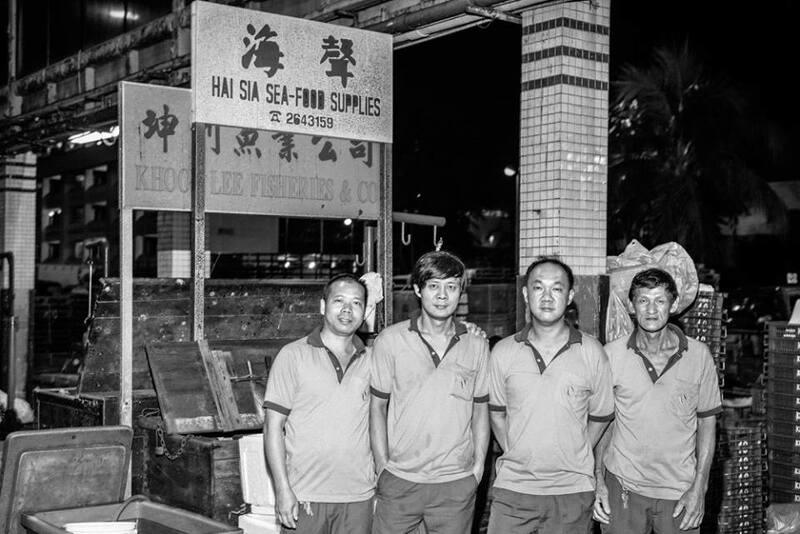 Hai Sia Seafood began as a little hawker stall in Queenstown’s Mei Ling Street. In Teochew, Hai Sia means the ‘sound of the sea’. 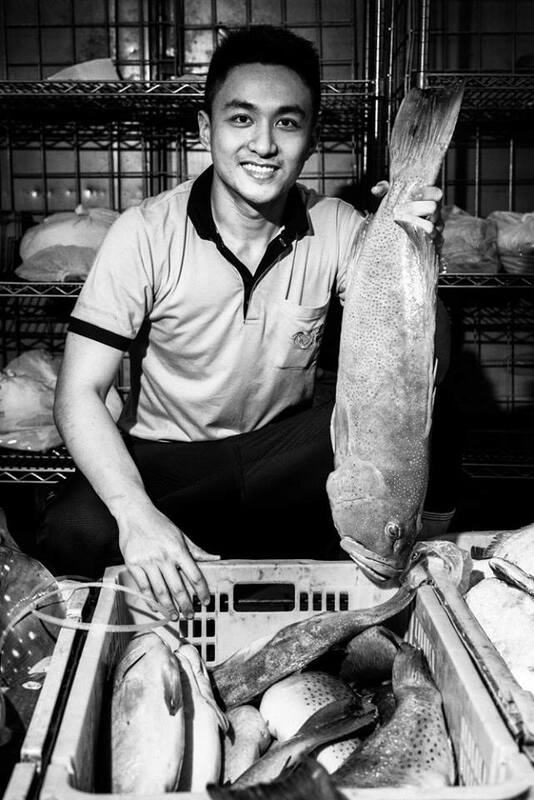 28-years-old Ang Junting is the second-generation owner of this wholesale seafood distributor, taking up the reins after his father entrusted him with the business. You could say he’s a young and far-sighted fishmonger. But before he took the scaly path of business management, Junting was on the wok-way to becoming a professional chef. He studied hotel management in Europe; studying in Switzerland and France, did an exchange in Germany, and an internship in Portugal. He had also taken up internships in Singapore and China. He sheepishly admitted that he had spent more time at work as a part-time cook while he was in France studying, as his curriculum “was not very intense”. In an interview with Tiger Airway’s in-flight magazine, Junting was asked by a chef about his family business. Upon learning about Hai Sia, the chef said something which led to Junting’s turning point in life. He made a comment saying how if I were to strike out on my own, I’d be building on a couple of years of experience, but if I were to return to help my father, I would be taking over a legacy. This incident, Junting revealed, took place in China, where he had worked at after graduating. He returned home to Singapore afterwards, partly because of this exchange. Junting explained that in France, being in the culinary arts is a life-long career. Cooks like him work as long as 14 hours on weekdays and up to 17 hours on weekends, and the “pay is not amazing”. However, he said that there is this “strong sense of camaraderie and stewardship” amongst the cooks because of the standards they had set for themselves. They would arrive before daybreak to finish their basic preparations early so that they can learn from the other chefs across the different sections. They start work at 8am but by 6.45am, all the cooks would have been parking their bicycles and heading in to the kitchen. On the other hand, in Singapore, the mindset here is different whether or not it is a family business. We are often discouraged by our loved ones to undertake jobs that are beyond office hours and a five-day work week. It is this stark difference in cultures that I am struggling with even now, as I recruit and build the team in Hai Sia. Having experienced two contrasting cultures, he recently only realised that he found his job less of a challenge compared to his peers because he has seen his father work ungodly hours since young. He recalls when in primary school, his father would leave home at 11pm after his siblings and him have turned in, and then find his father sweaty and smelly when he came home at 2pm after they had returned home from school. Hai Sia is first and foremost, Junting’s father’s labour of love. He had fondly labelled the senior Mr Ang, who is 68 this year, as an “open-minded Teochew towkay” in an interview with BiTES Magazine. So even though Junting is now Deputy Director, that does not mean his father has taken a back seat in the business. 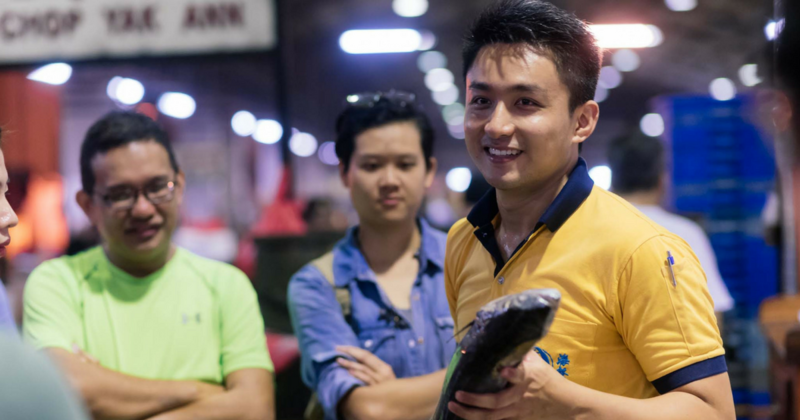 “Mr Ang still comes in to buy fish every night and morning,” said Senior Marketing Executive Melvin Sim (28), who also leads the free walking tours at Jurong Fishery Port. The free walking tours was conceived to raise awareness about the industry. 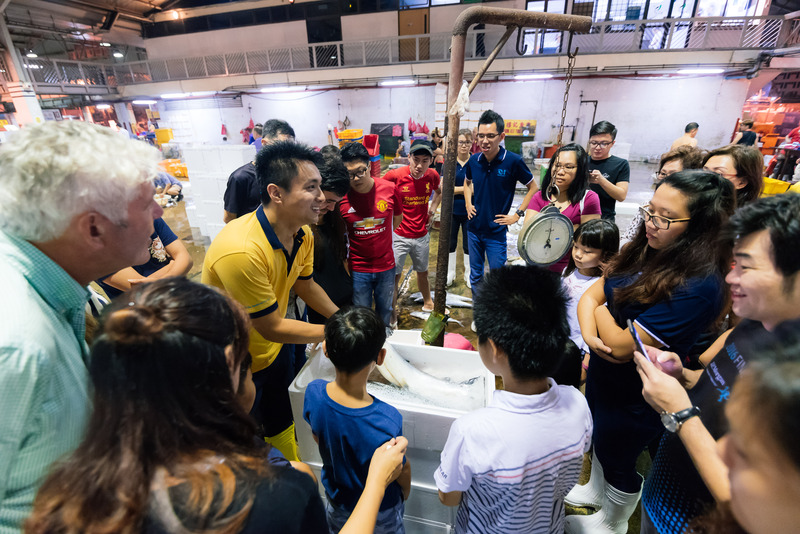 In that feature, Junting said that the fellow fishmongers at Jurong Fishery Port “enjoy seeing visitors to the port” and that it is “also a good way to expose outsiders to a fishmonger’s life” while letting them stay in touch with the world apart from the fishery. One of the things Junting thought his father would disapprove of but unexpectedly, readily agreed on was the rebuilding of the entire processing plant. Hai Sia has recently invested a sum of money into rebuilding their 20-year old processing plant – which actually, is not an immediate need yet as it could still be used for another good five years. This move was inspired by a trip to Kyushu, Japan two years ago. Both father and son had visited several processing plants across Kyushu but one of the plants had struck them as the most memorable. It was a 15-year old sashimi processing plant whose standards were “way beyond” theirs even though it was old. Like Hai Sia, that plant dealt with a large variety of produce. On the plane ride home, he proposed to his father the plan to rebuild the plant. By the end of the plane ride, we had already decided to pull the team together and put all the best practices we have learnt into practice. Junting said that through their study trips and annual visits to their core suppliers in Japan, Vietnam, and Indonesia, they got to see “top-of-the-line infrastructure and the best plant management practices”. The new plant streamlines the operations and “there is now controlled risks of cross-contamination”. Since taking up the mantle of Deputy Director almost three years ago, Junting has moved Hai Sia forward in many ways – even though he revealed that sales did not improve at all and revenue took a hit over the past two years because of certain business decisions. He said he wouldn’t call jumping on the digital bandwagon a transformation, but transformative. Junting said he faces a HR problem, specifically, recruitment. He is happy to be working with a great and experienced team that has watched him grow up, one school holiday at a time from when he was 14. But he said that they have to plan ahead as they explore new opportunities and directions. The company is constantly on the lookout for people who can see themselves grow in Hai Sia. More often than not, Junting confesses that he scares new recruits off with his expectations. He further explained that if a chef has given a feedback that the fish was not gutted well or filleted properly, they should be able to know what to do and respond appropriately. His plan is to be patient and the right candidates will appear. He counts his blessings to have successfully recruited younger individuals over the past three years and has learnt from his past recruitment campaigns. While some people may misunderstand him, I personally think that it is very endearing. He treasures the loyalty and the self-sacrifices they have made for the company. Some of them joined Hai Sia when their children were born and now, they are preparing to send them to universities, with some of them who are doctors and MINDEF scholars. I would like to think that the effort by my father and uncles, with the help of the team, gave them a much better living than when they first started with us. When asked if he had ever wished that he should’ve gone on the more glamourous path of being a chef than a full-time modern second-generation fishmonger, he lightheartedly said that being a chef might not necessarily “be more glam”. He went on to explain that as a chef or hotelier, they can serve 50 to 200 people, but “as a modern fishmonger, we can serve many, many folds of that”. I feel like we are also doing our part in preserving hawker culture and local cuisine. It is not intuitive for a hawker to buy from a supplier like us. They tend to think that we are too expensive with our high overheads and GST. But we are also more competitive in terms of processing efficiency and economies of scale when we purchase. We also have a wider range of products to offer. 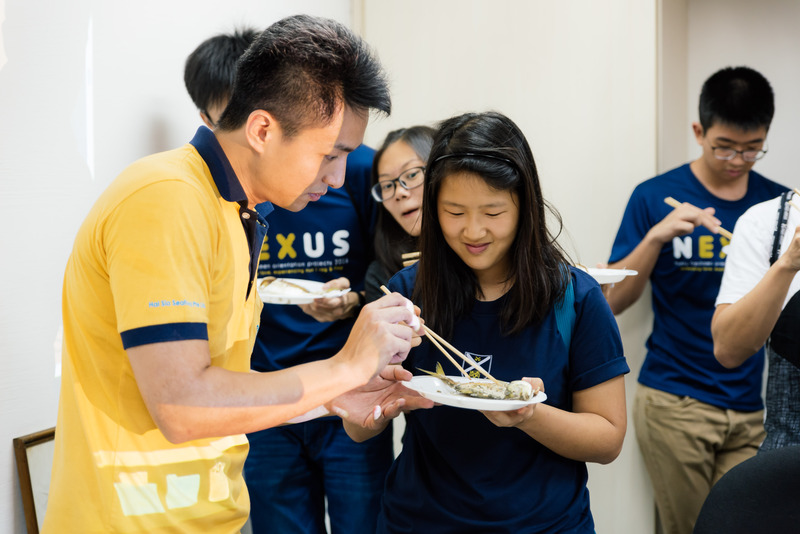 Junting gushes that he is “super proud” to be given the opportunity to supply to some well-known establishments and brings his team to eat at those places often. 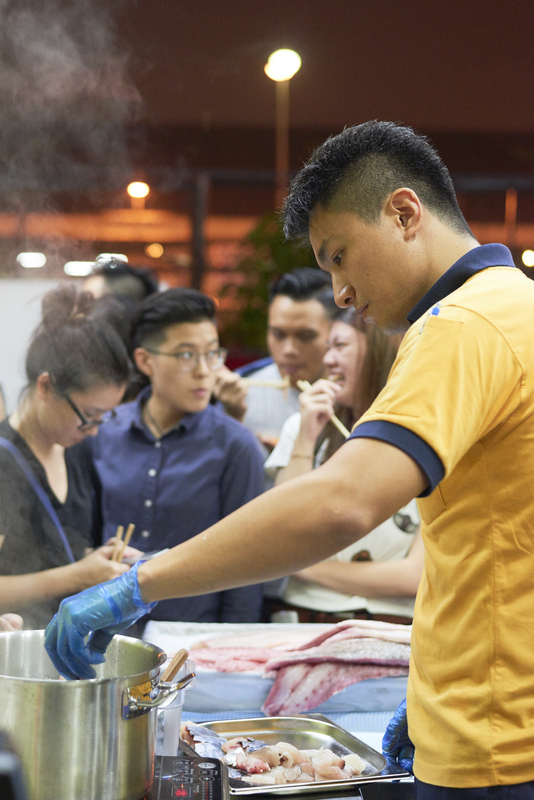 Both online and traditional grocers, hospitals, Teochew restaurants, nasi padang stalls, fish soup stalls, and Hainanese curry rice stalls make up a bulk of their business. He also expresses gratitude to the family restaurants that helped broadened their base. 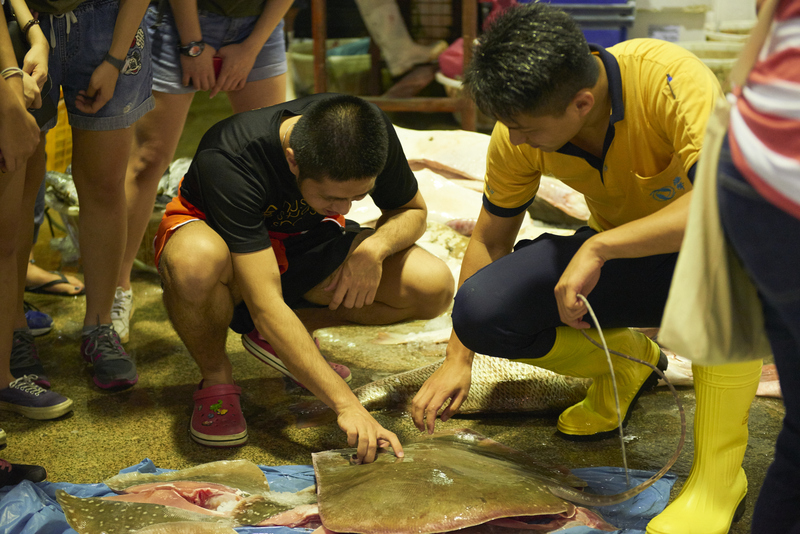 Even though he seems like a fry, Junting has already amassed over 10 years’ of knowledge, helping his father out since he was 14, scaling fishes for several years before he “was finally allowed to fillet a fish”. I could tell he really knew his stuff when I asked him to explain more about the processing plant (as I have never seen a seafood processing plant before). Junting was elaborate with his answers, thinking about the other ways to improve the processes, like automation. He added that the operations are venturing further beyond Southeast Asia when Hai Sia used to focus very much on regional produce. Previously, before the infrastructure changed, he admitted that whenever there were complaints about quality from customers, they would seize every opportunity to put the blame on the equipment or the inefficient work flow. Now that there is no excuse to do that, Junting said they are now channelling that energy into being more mindful of what they do and how they do it. Many habits and practices had been changed but he said the team has been receptive as they see the positive change around them. When they see that work is being simplified, they feel less stressful and happiness increases at work. Installing good sound system all over the plant and playing pop songs probably helped boost their morale. Hai Sia is diversifying, actively seeking out gaps in the local market and openings in the overseas market to import from. He focuses on bringing value to the market here with products that are similar or better in quality at a lower price point. When I asked him what words of wisdom would he give to millennials, he humbly said he isn’t fit to be giving any yet. For every 10 conventional jobs you can think of, there are 100 more unconventional ones. They are often much more interesting. To take up these unconventional jobs and succeed, (you have to) 1. Take a dive and 2. Be committed. 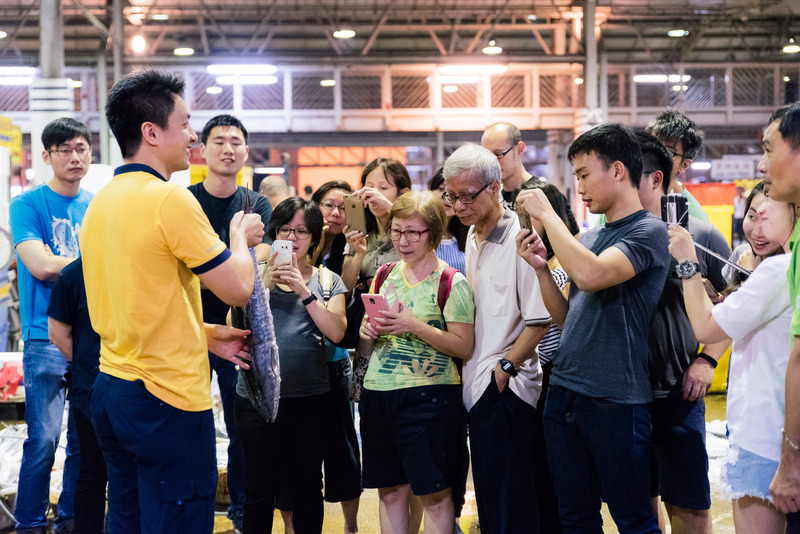 Visit Hai Sia Seafood here, and sign up for their free walking tour around the ‘Tsukiji Market of Singapore’ here!